Enter for a chance to win a relaxing retreat! Ready to unwind? 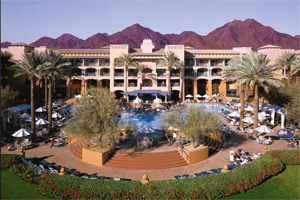 You could win a getaway and "Golf Fit" package for two at the Fairmont Scottsdale Princess. The winner and a guest will receive a four-night stay, fitness session with a personal trainer, round of golf, and golf lesson with complimentary gourmet lunch, massage and spa treatment at their luxe Willow Stream spa, plus breakfast daily. American Airlines frequent-flier miles provided for airfare. For a chance to win, go to Health.com/fairmont-scottsdale-princess, and tell us in 50 words or less why you deserve a spa vacation. No purchase necessary. Purchasing does not improve your chances of winning. Visit Health.com/fairmont-scottsdale-princess-rules for official rules, to learn how to enter, and more. Contest begins September 24, 2010 at 12:01 a.m. (EST), and all entries must be received by 11:59 p.m. (EST) on October 21, 2010. Open to legal residents of the 50 United States and the District of Columbia age 21 or older at the time of entry. Void where prohibited by law. Tell us in 50 words or less why you deserve a spa vacation.